PHP archive aka phar is a stream wrapper which can serve any packaged PHP library efficiently. 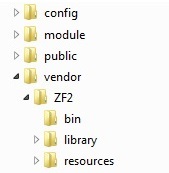 This works as simple folder of your file system. Easily distributable, packaged.